I sometimes feel that God is really having a Hard Time as he made Humans and we are totally responsible in destroying the Earth…. Great post !! It’s so easy to just do everything “in the name of god” or “for god’s sake” !! Maybe there won’t be any doomsday after all. We’ll all finally perish…killing each other if not for religion then something else. Somewhere someone is on a killing spree. What about someone entering a school/ camp and shooting at kids just like that…But of course religion is just the simplest excuse. Tragic. And man is considered evolved to a ‘superior’ race! true bhai !! its a pity and shame that humanity is the biggest threat for itself. It’s a pity that even Gods are not safe in our ‘culturally rich’ and traditionally God-fearing nation. The only message the carnage has left behind is ” Peace Be Damned”. No political or religious mandate can be greater than human lives. it is sad to know that they dont even fear GOD. Atrocities done i the name of God. God ? 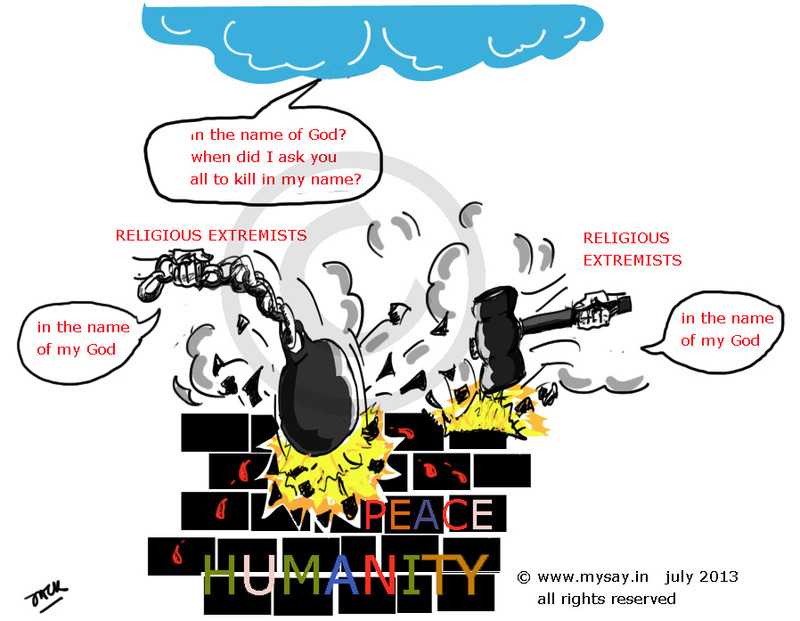 Yours is not mine is God – thats what these extremists convey … and believe !! Exactly! What kind of twisted people are these?